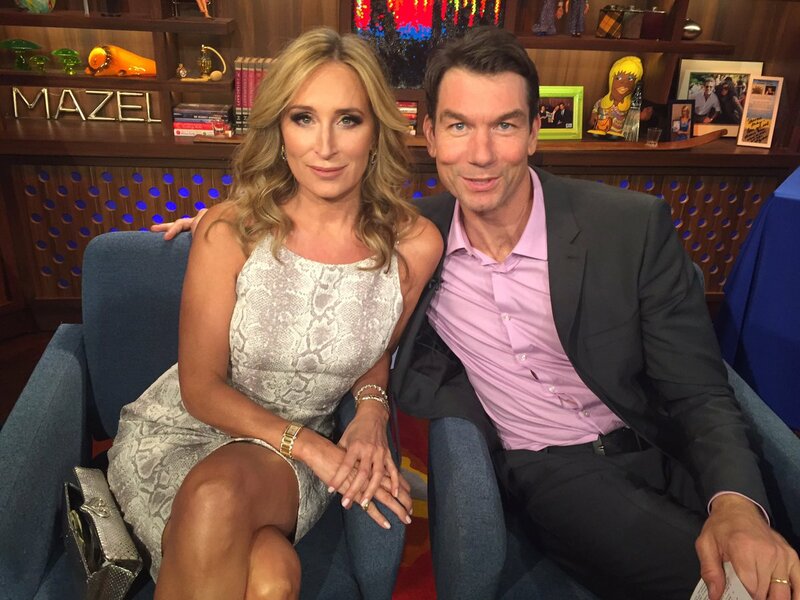 Sonja Morgan (wearing a cute dress from her Sonja Morgan New York Collection) was in the clubhouse on Watch What Happens Live tonight, along with Housewives superfan Jerry O’Connell. Sonja shared her feelings on her co-stars, defended her ‘drinking’, and much more. On her relationship with Luann’s fiance Tom, she says that they’ve known each other for a long time – more than ten years. She doesn’t exactly say how long they’d been hooking up, but she says it was a recurring thing. Sonja says that Tom did not get to test out her rejuvenated lady bits – but she reveals that she was with him right before Thanksgiving and Lu got with him right after Thanksgiving. Sonja reveals that she hasn’t given her new rejuvenated hoohah for a spin yet and that she’s even given up dating young guys. Which Housewife would Jerry want as a mistress? “I don’t want to get in trouble here but rumor has it that one of the NY Housewives has hit the reset button downstairs, if you know what I mean. I’m old and married, but everyone loves that new car smell.” Andy has dubbed it the Vagonja. Sonja says that the Tipsy Girl is going – there are 10,000 cases in the warehouse of the pink prosecco. It’ll be at the restaurant and in liquor stores. On the After Show, Sonja reveals that she tries to watch Southern Charm, but she finds it emotionally draining. Sonja and Jerry share their thoughts on the blowout in the Berkshires: Jerry says that he didn’t like it because it’s not cool when two people (Bethenny and Carole) gang up on one person. Sonja says that she knows Bethenny has a lot on her plate, but it was unfair to Luann. Sonja explains again that SHE can’t change the Tipsy Girl name since her two partners are the ones who trademarked the name. TELL US – ARE THE LADIES PICKING ON SONJA MORE THAN EVER THIS SEASON? WHO DO YOU BELIEVE ABOUT THEIR HOOKUPS – TOM OR SONJA? Poll question: Should Luann care that Tom gave his ex a gold bracelet? 71% voted YES. Note: Hopefully Bravo will release the clip of Jerry reenacting Dorinda’s rant in the Berkshires. It was great! Did Tipsy Girl Copy Another Alcohol Brand With This Painting?